This is the updated edition of the 2004 edition Drew Struzan: Oeuvre. The publisher Titan Books considers it a brand new edition, with lots of additional and up-to-date material, plus text by Dylan Struzan - Drew's wife. It is described as 'a sumptuous companion volume to The Art of Drew Struzan'. So what's the difference between this book vs The Art of Drew Struzan and The Movie Posters of Drew Struzan? The Movie Posters of Drew Struzan is a 120-page hardcover selection of movie posters up to 2004. The Art of Drew Struzan is the 160-page hardcover selection of works featuring lots of accompanying sketches together with his finished drawings, complete with commentary on his thoughts and stories behind each piece. Oeuvre is collection of works representing his career, up to 2010. Much of what you see here is duplicated in The Movie Posters of Drew Struzan so there's no point getting that book, especially when the price different is small. Even though there is duplication in The Art of Drew Struzan as well, that book is still worth getting because of his sketches and if you want to read about his creative process. Drew Struzan's art is beautiful, possibly unparalleled. You already know that. The amount of work he created is immense and this book is a tribute to his mastery. It's a 314-page large format hardcover with illustrations all printed at full page on good paper. You're getting close to 300 illustrations. This is an amazing value for money. His familiar works for movie posters are all inside, arranged into the type of work namely, music, movies, commercial and personal. The bulk of work appears in the movie section, of course. You'll get the see familiar works he did for Star Wars, Back to the Future, Indiana Jones, and many of the lesser known ones. His portfolio is awe-inspiring. For this 2011 reprint edition, Some of the new works included, those after 2004, are Cowboys and Aliens, Pan's Labyrinth, Indiana Jones and the Kingdom of the Crystal Skulls, Hellboy II, The Walking Dead. Some of this have appeared in The Art of Drew Struzan but included here to make this collection complete. 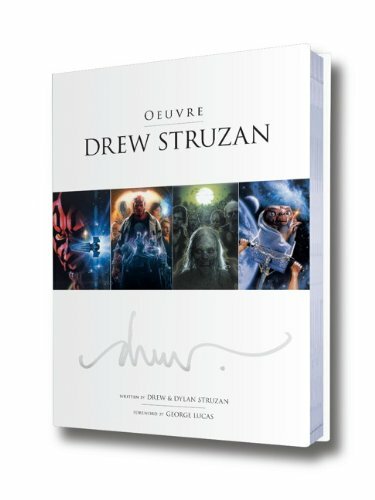 So if you actually have the The Art of Drew Struzan and the 2004 Oeuvre, there's no need to get this edition because you already have all the art. The personal pieces included are some figure drawings and paintings that are done in a non-Drew Struzan style, compared to his movie art, or course. The captions for the illustrations appear at the back of the book, arranged by page order, describing the medium and what the art was for. I wish there was another index listing his work alphabetically because sometimes it hard to find a particular title from those 300 plus pages. The alphabetically arranged copyright index at the end could do with those page numbers. Oeuvre is the definite collection of Drew Struzan. If you have to get just one, this is it. Most highly recommended. One of the best art books for 2011. This is amazing! This is definetly on my list. Never really heard of Drew Struzan until you introduced me to his work Parka. Since you seem to love photo realistic art like most of us do. By any chance will you be reviewing Alex Ross' new art book in December? Don't really know much about it, but Amazon.com has it listed for a December release. Thanks, I've been waiting for this review!! Some things to point out, though. Do you actually own the 2004 edition? The texts were written by different authors; this print has Drew's wife as the commenter. Also, it seems like the 2004 edition was of a SIGNIFICANTLY larger format, can you confirm this? Lastly, the 2004 oeuvre and the "Art of Drew Struzan" together do not contain all the art of the 2011 oeuvre. Some additional things that could be spotted were the "Walking Dead" and "Cowboys and Aliens" posters, his Indy Disneyland stuff, Lord of the Rings and much of the personal work is previously unseen or at least unprinted. Bonus question: Has the Frankenstein poster made it into this edition? I don't have the 2004 edition. Amazon has the first edition listed as 10 by 14 inches. This 2011 edition is slightly larger than 9 by 12 inches. The Frankenstein poster is included. I'll be getting the Alex Ross 2011 art book. I have the previous book, and was interested in getting this, but if the difference is small (content-wise), I'm reconsidering. The "Art of..." book had, in my opinion, subpar printing... but the content, of course, was fantastic.